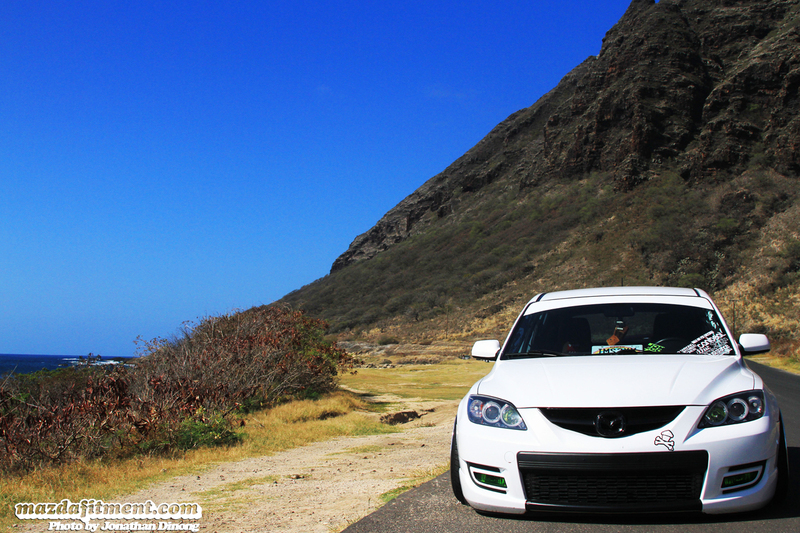 We are back in the Hawaii Islands with this memorable vehicle owned by Brad Pearl. You probably remember this 2008 Crystal White Pearl Mazdaspeed 3 on Advan SA3R, and if not check out Brad’s last feature here back in July 2011: 808 Flavor. This time around things are different with wider wheels and a good amount of wheel lip all around. Minus all the stickers (which all have a purpose since it is who he supports and those that support him), this has some nice qualities. The Black vinyl below the stock mustache and the Black wrapped grill are a nice touch to create a different appearance to the front end in an inexpensive way. The Green vinyled fog lenses are a detail from his White and Green theme from the previous setup (the Advan SA3Rs), which he is trying to sell right now. 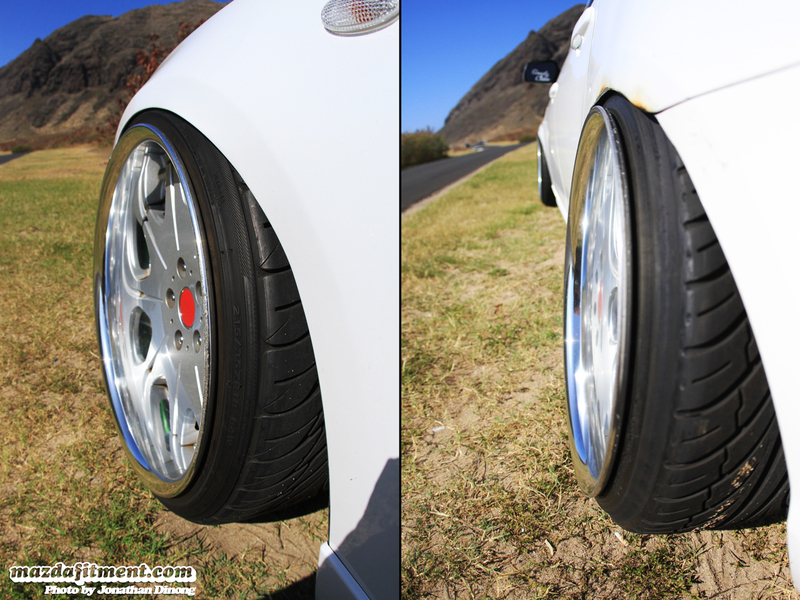 Check the Mazda Fitment forums if you are interested in buying the Advan SA3Rs. 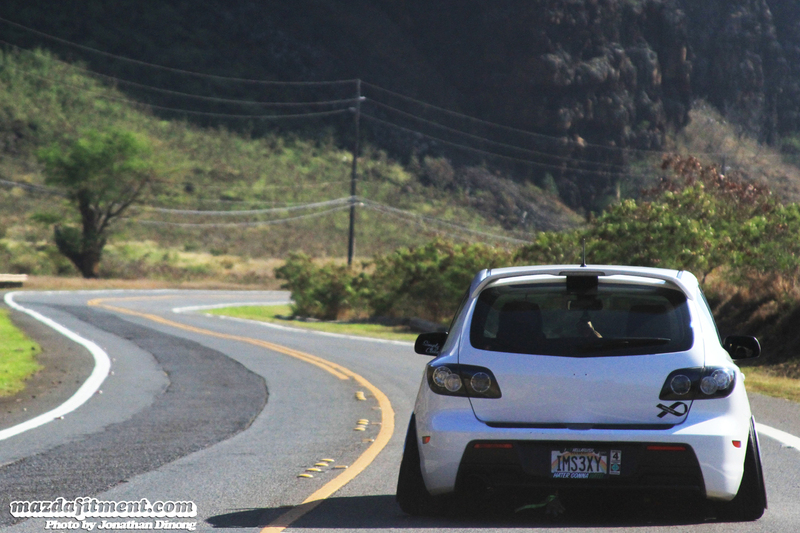 Brad representing SMG (Sexii Munkii Garage) with these Work Varianza D3S. The front wheels are 18 x 9.5 +0 and the rear wheels are 18 x 10 -7 with a 215/35/18 tire all around. Some crazy numbers right there. Brad notch the front camber plates in order to pull more negative camber and had to pull his front fenders a good amount (Around 10-15mm) more in order to fit something that wide compared to most people out there. The rear 18 x 10 -7 was accomplished by using Dominant Engineering adjustable camber arms, that were shortened a good amount to get more negative camber in the rear and a little more fender work. Rear shot of Brad’s wide fitment. Looking pretty good as he drives away around the island. Thank you to Brad for letting us share this with the help of photographer Jonathan Dinong for getting us these quick shots. Hope you enjoy this for what it is and the work that was put in. It might not be your thing, but you have to have automotive appreciation for every aspect for the car scene. NextAir Ride is Cool Too! Keep it up Brad. Im already ready to see what new rims you’ll be rockin for 2013! Dooood ur car is sick! !